"The Maximals build hope, then we blow it up." Slice and Dice are the result of a spark that split during it's formation, resulting in two nearly identical sparks. 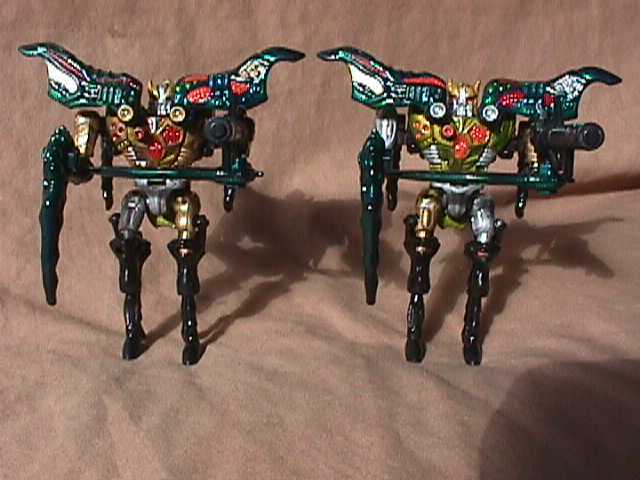 They are the Transformer equivalent of identical twins, and were placed on the Axalon together in the hopes that the bond they share would be used for exploration. Instead the Predacons recovered their pods, and now they use that bond against their creators. In many ways, they have more differences than similarities. Slice is the quite contemplative one, who often spends more time planning a move than actually making it. Dice prefers to react to a situation with reckless abandon, jumping into a situation no matter how the odds are stacked against him. In their insect modes, they can cling to any surface, and are capable of flight. 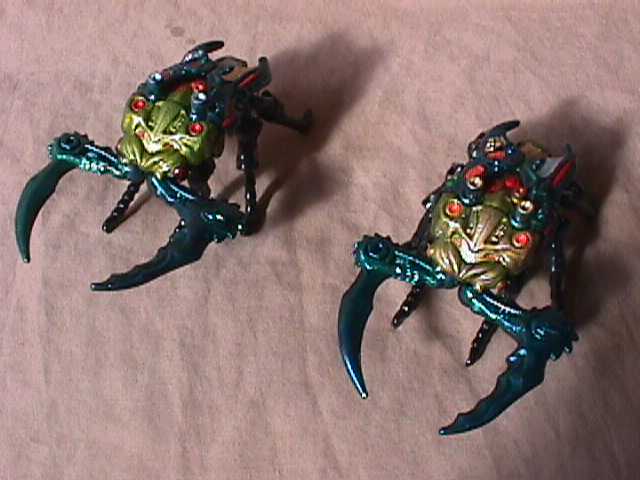 Their dagger like mandibles are usable in both modes and are made of laser sharpened neutronium, which is nearly unbreakable. In robot mode, they wield heavy pulse cannons, and have two chest mounted grenade launchers. These grenades have gravitic clamps allowing them to be attached to any surface, and can be put on an extended time delay. Their attitudes extend to their fellow Predacons as well, Slice prefers seclusion, to contemplate his next move, and Dice spends most of his time carousing with his fellow Predacons.